Twitter is unveiling several new features for advertisers that want their campaigns to go beyond the social platform. And it’s giving the program a new name — the Twitter Audience Platform. Last year, the company launched something called the Twitter Publisher Network, giving advertisers one interface for buying campaigns that ran not just on Twitter’s websites and apps, but also with publishers who were working with Twitter-acquired MoPub. Twitter’s senior director of revenue products Ameet Ranadive told me that the network now reaches 700 million people, and it’s getting a new name to better reflect the reasons that advertisers like it. “It’s really around audience — their goal is to reach a particular audience and leverage the unique data and signals that Twitter has,” he said. Facebook has also placed an emphasis on targeting ads beyond Facebook through its revamped Atlas platform. Providing broader reach for advertisers could be a particularly important challenge for Twitter, given its difficulties with user growth. As for the new features, Twitter says advertisers no longer have to focus on drive mobile app installs or re-engagements — they can also set an objective to drive tweet engagements or video views. 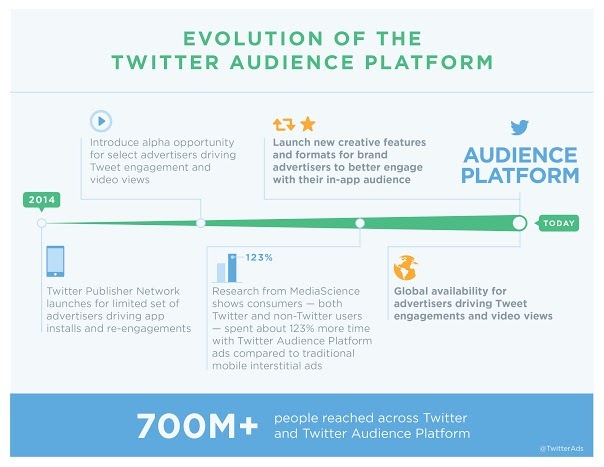 To support that, Twitter is also introducing new ad formats, with tweet engagement campaigns automatically transformed into interstitial and native ads in other apps, and Promoted Video campaigns becoming video ads. When you see these ads, you’ll have the ability to retweet or favorite them, directly in the ad unit. Taken as a whole, these changes mean Twitter’s network could become more appealing to a broader group of advertisers. Again, the Publisher Network focused initially on app install ads, but Ranadive said the new units are attracting more brand and international advertisers. Brands that have already tested out the new formats with positive results include Macy’s, JBL and Samsung Mobile in the UK. Twitter also commissioned a study from MediaScience showing that users spent 123 percent more time with Twitter Audience Platform ads than with normal mobile interstitials. You can read more on the Twitter Advertising blog.